Pamper your skin with Genuine Virgin Aloe TriDerma Diabetic Foot Defense Cream 4oz, model #64425. TriDerma is a line of true skin care products made with Certified Genuine Virgin Organic Aloe, moisturizers, and other carefully selected botanicals to target and help heal a wide variety of skin problems. 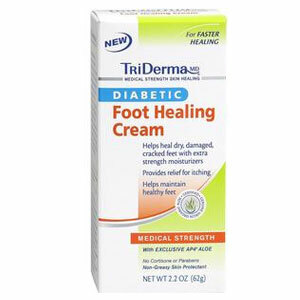 The Genuine Virgin Aloe TriDerma Diabetic Foot Defense Cream 4oz is a concentrated moisturizing cream that provides fast healing for dry, damaged feet due to Diabetes or poor circulation. It helps repair cracks and fissures, soothes itching and helps keep your feet protected with clinically proven ingredients. This powerful cream delivers deep moisture directly where it's needed to help heal, repair cracks and fissures and help keep feet protected to maintain healthy skin. Plus it helps calm and soothe itchy feet. Recommended by Doctors, Diabetic Educators and Podiatrists for healthy feet. Aloe Barbadensis (AP4 Genuine Virgin Organic Aloe Vera) Leaf Extract, Urea, Lactic Acid, Squalane, Zinc PCA, Beeswax, Polysorbate-60 (Plant Derived), Avena Sativa (Oat) Kernal Extract, Tocopheryl Acetate (Vitamin E), Butyrospermum Parkii (Shea Butter), Cetearyl Alcohol (Plant Derived), Sodium Hyaluronate, Panthenol (Pro-Vitamin B5), Cetyl Alcohol (Plant Derived), Ethylhexylglycerin (Plant Derived), Gluconolactone (Corn Derived), Phenoxyethanol, Tetrasodium EDTA, Sodium Lactate, Sodium Benzoate (Plant Derived).